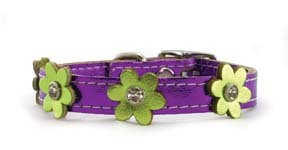 A colorful bouquet of Signature Leather flower collars will brighten up any dog. Available in leather and metallic. Choose from 8 color combinations, accented with sparkling crystals. The same great leather as our Signature Metallic Collars.